New Orleans is well known for its Mardi Gras, fine food, Bourbon Street, above-ground cemeteries and Jazz, but today I would like to concentrate on one of New Orleans’ latest attractions, The World War II Museum. We were in New Orleans specifically for the reunion of the 351st Bomb Groups annual reunion. In 1944 I was a bombardier with that group of heavy B-17 bombers as we raided targets in Germany and occupied France. As the veterans are all in their 90s, only five of us were able to attend. But with our families and friends we had a group of over fifty to enjoy New Orleans. The highlight of our trip would be the World War II Museum which is now affiliated with the Smithsonian Institution. It opened in 2000 as the D-day Museum, but expanded in 2003 to cover all of the World War II services and battles. An additional pavilion is in the planning stage. After a wonderful lunch hosted by the museum, we explored the European section, especially “The Road to Berlin” with all of its artifacts and explanations. Through television sets and movie screens we saw actual footage of the progress of the war, both on the ground and in the air. Most of it was so well done through creating scenes as real as movie sets, that we felt we were there, back in 1944. We also ventured into “The Road to Tokyo” with its first class exhibits, but cut it short to go to US Freedom Pavilion and specifically the Boeing Center where the planes were located. Suspended by wires from the very high ceiling, were a B-17 “Flying Fortress” like we used to fly, a B-25 “Mitchell”, a P-51 “Mustang” and a Navy TBS torpedo bomber. We could use elevators to see the planes at various heights. We had to go up three stories to see the B-17 at the proper angle. We all had a love for that airplane. We all saw an engaging movie in the theater called “Beyond all Boundaries” narrated by Tom Hanks. It created reality sight, sound and “touch”. As a tank roared over the battlefield, we could hear that grinding sound and its vibrations, as each seat we were sitting in rattled through some mechanism under the floor. Very realistic! We wandered into the Louisiana Pavilion where a British “Spitfire” fighter plane and a C-47 troop carrier hung from the ceiling. On the floor was a Higgins landing craft, the boat used by Army and Marines to land on the Pacific islands held by the Japanese. Many of these boats were manufactured in New Orleans. Another section called The Arsenal of Democracy deals with the home front during the war. This pavilion brought back many memories. Photos of bombers and tanks being built in American factories emphasized the power of our country’s production. Victory Gardens demonstrated what families could do grow their own foods. Other displays showed the transportation of goods, a typical 1942 home, the change of citizens to warriors, the tragedy of Pearl Harbor and the development of the atomic bomb. 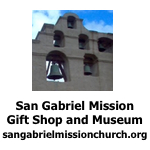 This is a marvelous museum which should be wandered through slowly in order to absorb all the exhibits. People who are interested in World War II will need a full day or more to explore the museum. 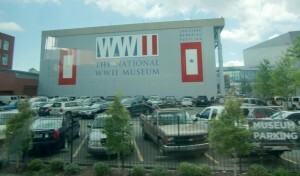 The fabulous World War II Museum was the highlight of our trip to New Orleans. 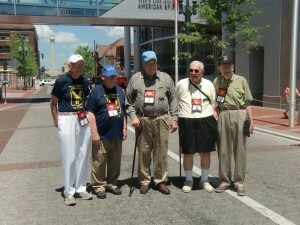 Only five of us veterans were able to attend the reunion. Hard to believe that we were in our teens and twenties during the war. 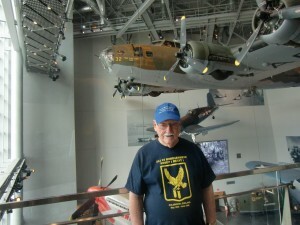 The author standing on a high deck of the museum with the B-17 bomber like he flew in during war suspended behind him. 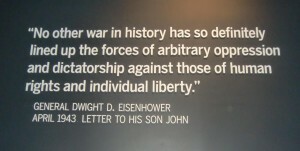 Eisenhower's statement sums up the meaning of WWII. Charles “Norm” Stevens, a 43 year resident of Monterey Park has recently published his 4th book: Seeking More of the Sky: Growing Up in the 1930’s. This is the story of a young boy growing up in Inglewood, California in the l930’s. This was a time during the depression when unemployment was affecting many and the banks were closed, while the clouds of war were gathering in Europe. But he was lucky enough to be raised in a loving family, the power of that love reflected throughout his stories. He is known to the readers of The Citizen’s Voice as the author of Travel Log Articles including “Cruising the Rhine and Mosel”,” Best of the West”, “In Search of Snow” , “From Paris to Normandy on the Seine”, and “Exploring New York”. He is retired, having taught for 32 years, primarily in the Montebello Unified School District. Those interested in purchasing an autographed copy of any of his books, may contact the author at 323-721-8230 or Normstevens24@gmail.com.